Mr Smith is still, in the grand scheme of things, relatively new to the online casino world. Established in 2014 by BML Group Ltd, it has since made a name for itself as a British Casino aimed directly at the British public. Despite this, it is available to a number of other countries around the world. There are notable exclusions, however, which include the United States, Spain, China, and France. The casino aims to offer high levels of security to its players and does so through protecting the site and any client data with an SSL encryption. The casino is also licensed with the Malta Gambling Authority, which ensures that the casino follows strict guidelines ensuring that player safety is paramount. The site is also regularly audited to ensure that all the games are operating fairly, ensuring all have a great experience. The setup of the website is aimed directly at the players on the site - the colours are soft and unassuming and it is easy to use and navigate, translating well across both the desktop and mobile platforms. This means that it is so easy for players to access the extensive range of games that are on offer, from anywhere that they wish - as long as there is internet access of course! Like all online casinos, Mr Smith has a series of bonuses available for any new player looking to sign up for an account. These bonuses help to bring in players but with added promotions running on the site as well, will potentially keep them playing there for longer too. For new players to Mr Smith, there is a match deposit bonus that comes in three levels. Depositing £25 will award the player 25 cash spins on Starburst, £100 will reward the player with 100 bonus spins on Starburst, while a whopping £200 deposit will pay out 200 bonus spins on the same slot game. 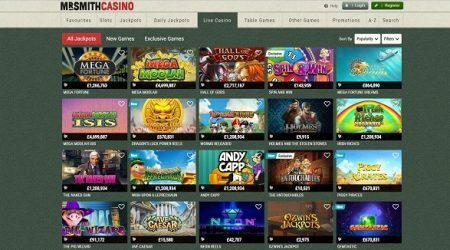 Players will have to select one of these offers when they make their first deposit after creating and registering their brand new account with the casino. Most online casinos will have wagering requirements in place, especially on the welcome bonus, to ensure that players are not just using the casino and planning on taking the money without playing. However, in the case of Mr Smith, there are no wagering requirements in place on this welcome offer. The only thing to note here is that the spins must be claimed within 14 days of signing up and used within three days of actually receiving them or they will be forfeited. Mr Smith casino appears to offer a wide range of additional promotions and bonuses to their loyal customers that stay on. These seem to change on a regular basis but can include a variety of bonus spins, bonus cash, and further match deposit bonuses, alongside actual prizes as well. In order to see the full extent of what is on offer, players will need to log in to their individual account each day to see if they are eligible for a bonus, or if there is anything new. Changing the bonuses regularly means that there is always something exciting available. 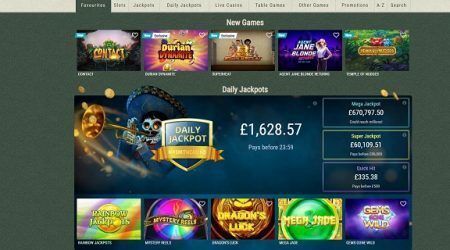 Mr Smith casino offers a fair few hundred games to its collection. It utilises the software from gaming giants such as NetEnt, Microgaming, Play’N GO, Playtech, IGT and Amaya Gaming. The majority of the games found here are slot games, and you can pick from some of the absolute best, including Aliens, Thunderstruck II, Zeus 1000 and, of course, if you feel your luck is in, you can play a range of progressive jackpots such as Mega Moolah, Hall of Gods and Mega Fortune. Players can also access a range of virtual games such as blackjack, baccarat and roulette. Each of these games is available in a number of different formats so that players can find out which style and rules they prefer. There is also a great selection of video poker games to keep those players happy. Finally, this selection is completed by some bingo games, which allows those preferring something a little softer and more relaxing a shot at some top prizes. Mr Smith casino also offers a really exciting live casino section. Real-time tournaments are available which see you pit your wits against other players and real dealers. This brings the excitement of a land-based casino directly to your home. Games available include various blackjack, roulette and baccarat options. More specialised games include Texas Hold’em, Dream Catcher, Caribbean Stud, Three Card Poker and more. If you are looking to combine gambling with watching sports, then the Football Studio will be right up your alley. At this time, Mr Smith does not appear to offer any sports betting options. When looking through the game selection, there were no virtual sports games such as horse racing available either. It is unclear whether such a section will be added to the casino in the future. Stay with us to hear any updates on whether a sports betting section will be added. Mr Smith offers a number of standard and secure payment options for both making deposits and withdrawals. These include PayPal, Skrill, Neteller, Paysafecard, Entropay, Visa and Mastercard. The minimum and maximum limits for both transaction types will vary depending on the player and these can be checked in the personal account and will reflect the selection made at the time of signing up. While deposits will occur instantly, withdrawals can take as much as five days to complete depending on the method used. There are no fees associated with any of the transaction methods, however, which makes this a great option when trying to choose which online casino to join. The only thing players will need to check is whether any fees are coming from their own banks. Mr Smith casino has an excellent FAQ section on the site which gives information and answers to the most common issues and questions. If this fails to help, then there is a customer service function in place that will help to resolve any problems that you may have. This is in the form of an email, and surprisingly, will take only a short time to elicit a response. In addition to this, there are phone helplines and a 24-hour live support function. This latter option is without a doubt the best one of the three as responses occur within minutes and problems can be solved in real time by helpful, friendly and knowledgeable staff, making the whole experience a highly enjoyable one. Despite catering to other countries, English is the only language available. 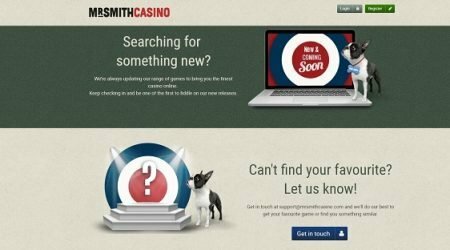 Mr Smith offers a nice new take on the online casino. The site itself isn’t gaudy or in your face, but simply does the job it was designed to do. It offers a great, navigable site, no matter what platform you are accessing it from. The range of games is also similar across the platforms meaning that if you are on-the-go, you can be certain that you won’t be missing out on anything. With high levels of security, great customer service and a wide selection of games, Mr Smith Casino has really hit all the right buttons. Players will be hard-pressed to find anything wrong with the site at all. It offers a decent welcome bonus and fast transaction times, making this a good start to anyone’s online gaming experience. Don’t just take our word for it though, head on over and have a look for yourself.